Provided you can rely on everyone involved to be comically incompetent, Ice Cool gives a disproportionate return of fun for your investment of time. We gave it three and a half stars in our review – much like ice itself, that fun cannot reasonably be expected to last. If you can get it in front of enough different people often enough though – it’s very likely to be well worth your time. If you can play it. Let’s see whether this ice is going to crack beneath our feet as we start to kick it from every angle we can reach. Er – are you sure this one is fresh? 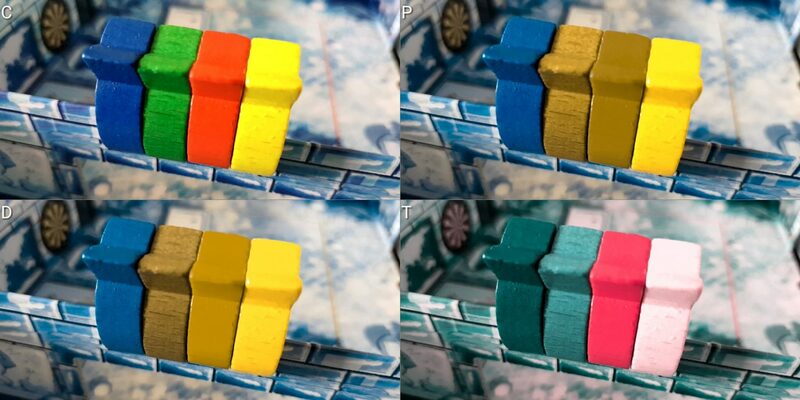 They’re all clearly possible to differentiate, but that’s in large part because the green fish (the second from the left) has a very noticeable grain pattern that clearly delineates it from the red and the blue. I don’t know if that’s an artefact of production or a reliable guarantor. 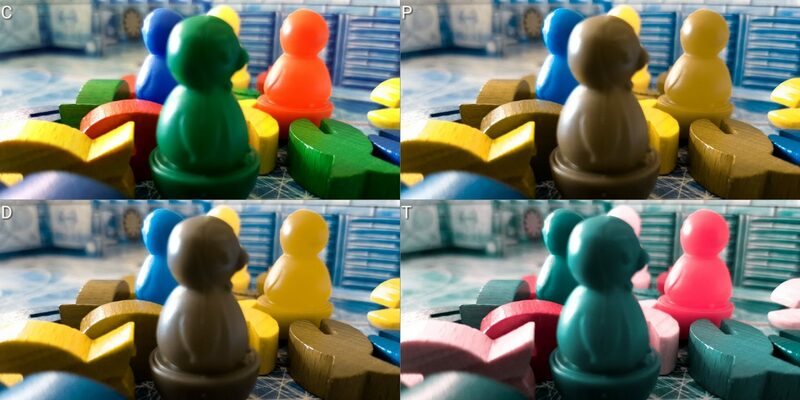 In any case it doesn’t really matter – there are only three fish in play for each player at any one time, and you’ll likely remember easily enough which ones remain for you to collect. In any case, while they serve a structural role in keeping the game together, they’re not critical for that – there are standard white pins that are in place for the duration of the game. You could track fish acquisition through any means you like without it impacting on your fun or on the solidity of the game board. The penguins themselves are more of an issue because they are neither amenable to replacement nor particularly distinct in palette. Red and yellow will be a problem for Deuteranopes and blue and green will be a problem for Tritanopes. Those with Protanopia will likely be able to tell the red and green apart, but lighting is a factor here. In good lighting, this will all be less of an issue. Even if it’s going to manifest itself as an accessibility issue it’s not a massive problem. 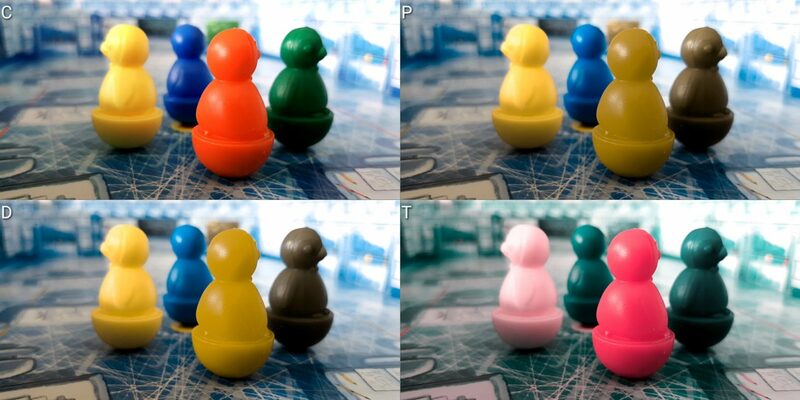 Even in a four player game where all colours must be used you have a single penguin and you’ll know where you hit it. You don’t spend enough time between turns to lose the track of the game very often, and while you might need a reminder when two penguins are side by side, no game information or intention is leaked as a result of asking. We recommend Ice Cool in this category. Well, this is much more of a problem and for all the predictable reasons. Everything in the game has a tactile component but the simple act of trying to flick a thing at a thing is going to involve a degree of visual processing. It also involves binocularity of vision. If you’re trying to work out the exact angle and strength with which to hit a penguin, it’s important that you can assess distance and position accurately. With that in mind, even though you can feel for penguin position and fish location that doesn’t translate into visual accessibility. That said it also doesn’t necessarily translate into visual inaccessibility – not in this specific case. For this, it depends very much on what you want to get out of the game. Scenario one – you want a game where you can meaningfully accomplish tasks through building of skill. Ice Cool is a bad bet in that scenario if visual impairment must be considered. Even the act of knocking a penguin through a hole can be difficult enough at times. All the advanced trick shots that involve curves and jumps would be all but impossible if limited eyesight is a major factor in play. Scenario two – you just want to knock some penguins around a low friction board and have a laugh. 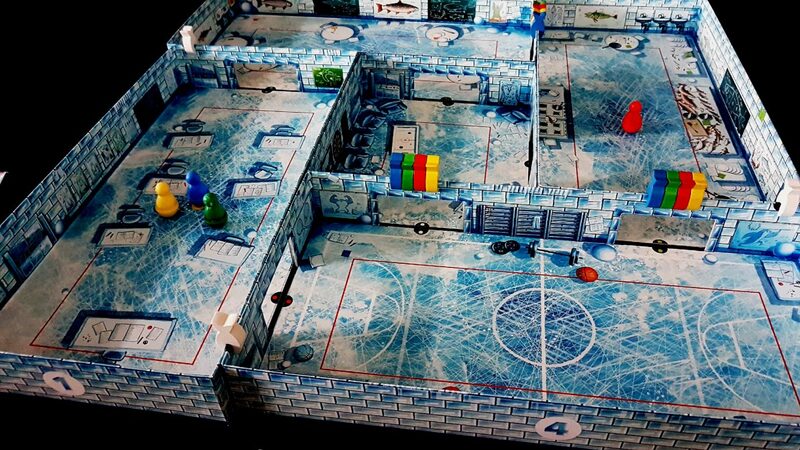 In that circumstance, Ice Cool might be one of a tiny handful of dexterity games that could genuinely fit the bill. There are several features here that make it a prospect. The first is that the game is played within fixed constraints, and those constraints have walls. You don’t need to worry about the pieces pinging off underneath a cupboard unless you hit them very hard. The second is that these walls also add potential for ricochets and accidental successes – sometimes it’s enough to simply hit a thing vaguely in a direction. The third is that the penguins themselves have an added element of erratic movement built into their centre of gravity. While you can build skill the game is balanced (at least in my view) around amusing failure. You don’t need to play well to have fun in Ice Cool. Even those for whom total blindness must be considered can meaningfully enjoy that even if some of the action will need to be narrated like a radio report on a football match. None of this would translate directly into an obvious recommendation, but I will say that if visual accessibility is an issue and people have the right mindset, Ice Cool is about as visually accessible a dexterity game as we’ve ever encountered to date. Man, it is good news wall to wall here. The rules are ridiculously simple, the game flow is consistent, and the skills needed to play and play well are physical rather than mental. There’s a degree of intuitive understanding of angles and momentum required to pull off trick-shots and complex moves but that’s not actually required. In many ways competences undermines the anarchic fun that’s otherwise available. There is a very small degree of numeracy required, but it can be bypassed (and indeed, to the game’s improvement) by simply summing up the number of fish that were captured. That in itself can be a task of comparison instead of arithmetic. In that case some kind of running total of wins would need to be kept if the element of competition is important. Really though you can just put two piles of collected fish beside each other and ask which has more – that’s the winner of that round. The ice skates and random points need not be a feature of play, but they’re not particularly cognitively expensive to include if you want all elements of the game preserved. As to memory, game state indicators are given for every part of the game. You know if you’ve been hit by the runner because they have your ID card. You know which doors you have left to go though, because the fish pins are still in place. You know where everyone is because you can see them on the board. You usually even know who just took their shot because their penguin is almost certainly still bobbing its head in recovery. We strongly recommend Ice Cool in both of our categories of cognitive accessibility. This is also a story of good news – while the game is competitive in that there is a catcher and a gaggle of runners (do penguins gaggle? Or is it a murder of penguins?) it’s almost impossible to take it seriously. Short of mismatched skill levels, even your dumb mistakes will lead to comedy errors on the part of your erstwhile antagonist. It’s hard to take failure in Ice Cool to heart because it’s a game that is explicitly about forcing you to make errors. Everything about the game, including the aesthetic, is constant reinforcement that this is just a silly thing you’re doing for fun. That however rapidly falls apart if there is a mismatched skill level, especially if one person in the game has made an effort to learn how to play well. You absolutely can build real mastery in Ice Cool far beyond what lucky accidents could explain. Someone that knows what they’re doing can curve penguins around corners, leap over walls, and knock penguins ‘snooker style’ away from their goals. This is a significant issue – it’s one that I raised in the review because it has a corrosive impact on the fun anyone can be expected to have. I think though that it’s likely to be an issue with vanishingly small relevance – I don’t doubt people can become Ice Cool masters if they want, I just suspect most people won’t want to. While mismatched skill levels are likely to be common, they’re not likely to be mismatched enough to trigger the problems relevant to this category. Picking up cards gives a random number of points, and as such it’s possible to be the most effective player and still lose by a considerable margin. That feels unfair, because it is unfair. To an extent, the way a pair of 1s can be used as ice-skates is mitigation for this but it doesn’t do much if all it does is get you a single point from gaining an extra card. One draw of a three card on the part of your opponent can immediately equalise on the advantage you may have painstakingly built. If that’s likely to be an issue, I’d advise simply basing it on the number of fish or ID cards that were captured. We’ll strongly recommend Ice Cool here because the big problem is likely to be something you don’t encounter, and the smaller problem of score randomness can be solved by simply counting accomplishment rather than the face value of cards. As with our section on visual accessibility this is about as accessibile a dexterity game as we can imagine. The fixed constraints, the walls, and the nature of play all mean that while physicality is an issue the design mitigates for a lot of minor impairments that would otherwise render a game unplayable. However, this is not a design space in which even being ‘the most accessible’ is much commendation. This is a category of games, wall to wall, that is likely to be inaccessible if physical accessibility issues must be considered. Often when we look at this section we see issues either in terms of fine-grained movement or gross movement. Here it’s both because you need to orbit the board to find angles of attack on the penguins, and you may have to adopt awkward body positions to get the precise rotation of fingers to accomplish what you desire. The fact you probably won’t accomplish it doesn’t change the fact the intention requires circling the game like a pool player. Should that not be an issue, flicking a penguin is easily rendered inaccurate through minor tremors and spasms in the fingers, and rigidity or discomfort in the hands will render play painful. The plastic penguins are not soft and in order to knock them with the required momentum it can occasionally be painful. I’m not saying this is a game that will leave you bruised at the end of it, but you will feel it in your fingers. Issues of numbness and lack of sensitivity in the extremities will also impact on how accurate you can be. As I say though this is a game about failing in a funny way, and as such being unable to play well doesn’t mean you can’t have fun. The physical barriers to playing well are high, but the physical barriers to having fun are relatively low with regards to this category of game. Verbalisation is functionally impossible except in its broadest, least satisfying terms. You can say ‘Flick my penguin through that door’ but it doesn’t mean much when the actual act of play is handled by someone else. Some games require direct interaction with the components to achieve satisfaction, and this is one of them. You could certainly instruct someone in fine detail as to what they should do, but that won’t have the same enjoyable tactility. This is a game that is about working with your hands. We still can’t offer a recommendation for Ice Cool in this category, but if there was a dexterity game we thought could be fun for those with physical accessibility needs it would be this one. 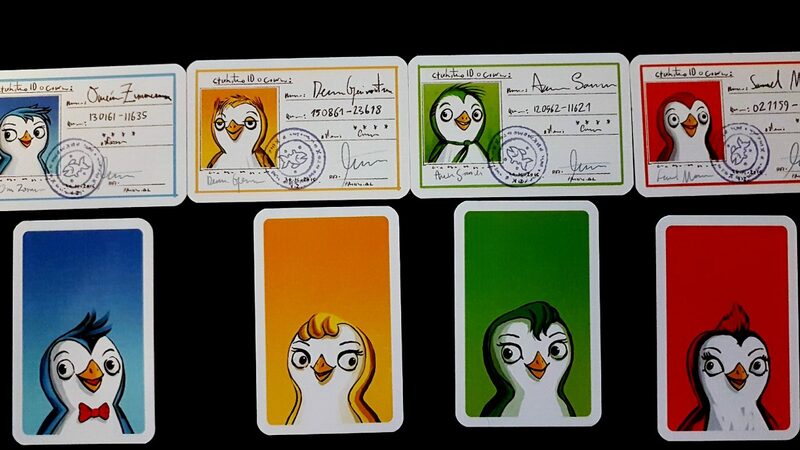 What’s interesting here is that even though the penguins come with ID cards, they’re not actually clear enough to make out specific details. The green penguin for example could be Aaron Summers, or Angela Samurai, or Allana Sabbatical. In any case, you can flip over the card and the coloured identifier to get a different portrayal. While some of the penguins appear gendered, there’s also a real degree of ambiguity. I think you could realistically project whatever gender identity you liked onto at least one penguin. This is a game that could easily have just ignored the issue of representation and answered ‘Dude, they’re penguins’ when I started ranting about it. The fact that they didn’t is great. Ice Cool has an RRP of £30, and it supports as many as four players. It’s quite a short game, but it has very wide-spread applicability in terms of its audience. It can be a big chunk of a game night if you want it to be, but it can also be something you play whenever you have even non-gamers around. It’s a game that is easy to introduce to people because it’s so immediately distinctive. It plays two players reasonably well too, so you usually won’t have a problem finding reasons to bring it out even if the game does go out of its way to disincentivise mastering it. We’ll strongly recommend Ice Cool in this category. There’s no formal need for communication during play. None of the cards have anything written on them that requires literacy, and the only noise will be that which you provide yourself as excited commentary to the action. We strongly recommend Ice Cool in this category. Well, this is an interesting gane because of how wildly it swings from ‘It gets our nod!’ to ‘Best avoid this one’. There are no intersectional considerations here that I think would make a major difference other than to say visual impairment combined with physical impairment would be enough for us to strengthen our recommendation that players avoid the game. It could perhaps be fun and playable for one or the other, but I suspect not both. 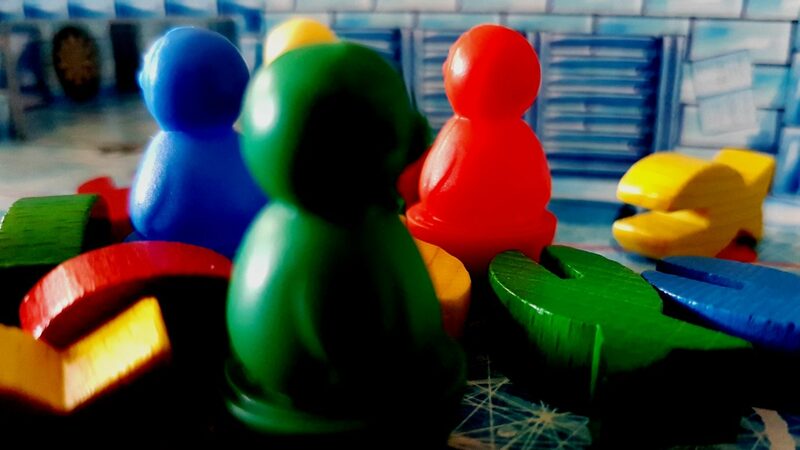 Ice Cool is a very short game, if you want it to be – the formal game rules say everyone takes a turn at being catcher and it’s over but it’s a tournament style thing that is amenable to all kinds of other modes if it’s necessary to worry about discomfort. That’s useful, because since this is a game of getting up and moving about it might be a little more taxing than most of the games we tend to look at here. It’s not exactly an aerobics class but you do need to orbit the game a lot to find the right positions for what you want to do. Ice Cool reasonably gracefully supports dropping out because the only player-count based changes are in how often players take on the catcher role, and what happens when they’re caught. You can realistically change player counts as soon as any one round is over and there’s no game impact. Failing that you can even change mid-round with some simple house rules. It might not be completely clean, but it’s certainly doable. Well – this was a surprise! I expected Ice Cool to come out of this far more bruised than it did, and that’s always good to see. I don’t like being aggressively negative all the time – it’s just that I call them as I see them. Ice Cool took my initial preconceptions about the inherent inaccessibility of dexterity games and put a little spin on the conclusions. Even with the grades it has achieved there’s more warmth in the text of the teardown than the letter would imply. I think if there was going to be a dexterity game that those with visual impairment could enjoy it would be Ice Cool. If there was a dexterity game where physical impairments wouldn’t be deal-breakers, it would be Ice Cool. While I still couldn’t go as far as say ‘You should play this’, I certainly think if someone wants to give it a try they’d be working at the most fertile ground we’ve yet found. We gave Ice Cool three and a half stars in our review – it suffers a little from experience coming at the cost of fun, but it’s still a good game that I think merits a place in collections the world over. It also comes out as easily the most accessible dexterity game we’ve encountered on Meeple Like Us. That alone is a mark of distinctiveness that merits your attention. Brain Games have done a good job here given the genre constraints within which they were working.